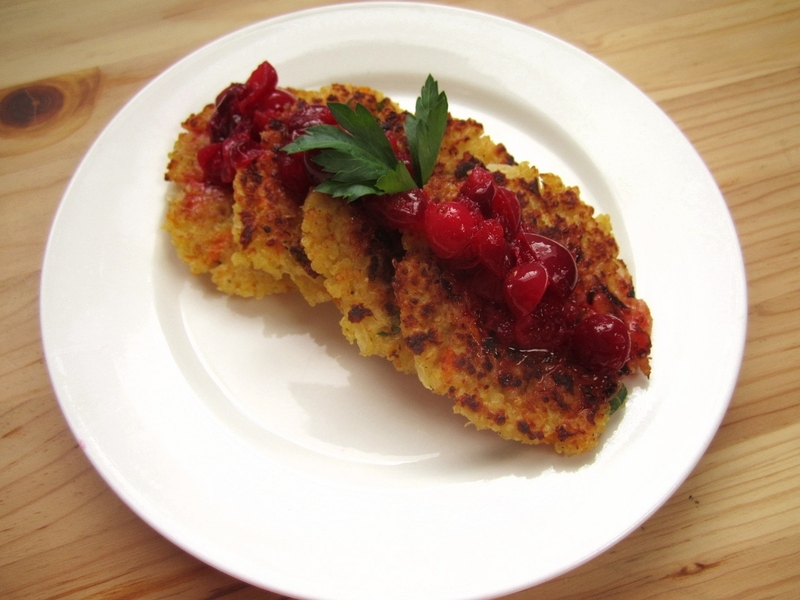 Quinoa Cakes with Sugar-Free Cranberry-Orange Sauce - Eat. Drink. Love. Thanksgiving week is here! This week, we will all be stuffing ourselves silly with delicious turkey, stuffing, potatoes, and pie. I’m not sure about all of you, but I can’t wait! But, in an effort to try to help make your dinners a little less carb-heavy, I came up with these quinoa cakes. Packed full of protein and flavor, they would make a good substitute for potatoes or stuffing. I topped them with some sugar-free cranberry-orange sauce to make these more Thanksgiving-y. But, these would be great any time of the year. A lemon aioli sauce would also be great to dip these in! 1. In a pot, add the quinoa, 1/2 tsp. salt, water, and broth. Cook about 10-15 minutes until the quinoa is cooked and liquid is absorbed. Set aside and cool to room temperature. 2. In a large bowl, add the quinoa, onion (you can saute the onion first if you prefer for it to be more cooked), carrot, lemon zest, lemon juice, parsley, bread crumbs, and Parmesan cheese. Add salt and pepper to taste. Whisk the eggs together in a separate bowl. Add to quinoa mixture and mix well. If the mixture still seems to dry, you can add some water, 1 tbs. at a time. 3. Heat a medium non-stick fry pan on medium-low heat. Add olive oil (I did about 2 tbs.). Use your hands to form small patties and gently place each cake in the pan. Fry on each side approximately 4-5 minutes per side. Once they are done cooking, place them on a paper towel to drain them and then serve. – Make sure your patties are an even thickness all the way around to ensure even cooking. Some of mine were thicker in the middle and it was harder to get the edges to brown since they weren’t touching the pan. – Before you flip your cakes over for the first time, make sure they are fully browned on the one side. If they are not cooked enough, they will fall apart. – Go easy on the oil. You should make sure there is some oil in the pan for each batch, but you really only need a little for each batch. I used a small pan and only did about 3-4 at a time so I only needed about 1-2 tsp. each time. If you drown these in oil, they will fall apart. 1. In a sauce pan on medium heat, add the water and sugar. Stir until the sugar is dissolved. Add the orange juice and sweetener of your choice. Add the cranberries and zest. Cook about 10 minutes or until the cranberries start to pop. Pour the sauce into a bowl and the sauce will thicken as it cools. Once it is cooled to room temperature, you can stick it in the fridge until you are ready to serve. Did you say sugar free! Yummm! The quinoa cakes look so delish! The fact they are healthy makes it perfect! What a lovely, delicious, original recipe! Terrific and I think they’d be delicious any time! Happy Thanksgiving! Those cakes look lovely! I have yet to see quinoa here, but as soon as I do, I’ve got a list of things I want to try and this is going on the list. What a great and unusual side this would make at Thanksgiving. I am a quinoa groupie. I can’t get enough of the stuff. This is really a creative dish with some tasty ingredeints. I like quinoa but do not have that many recipes, so I rarely have it. Glad to come across this savory dish and you have brought this out at a timely moment with the upcoming holidays. Well done-thanks for the recipe. Love that the sauce is sugar-free! I’ve never made quinoa cakes, sounds intriguing! These look amazing!! 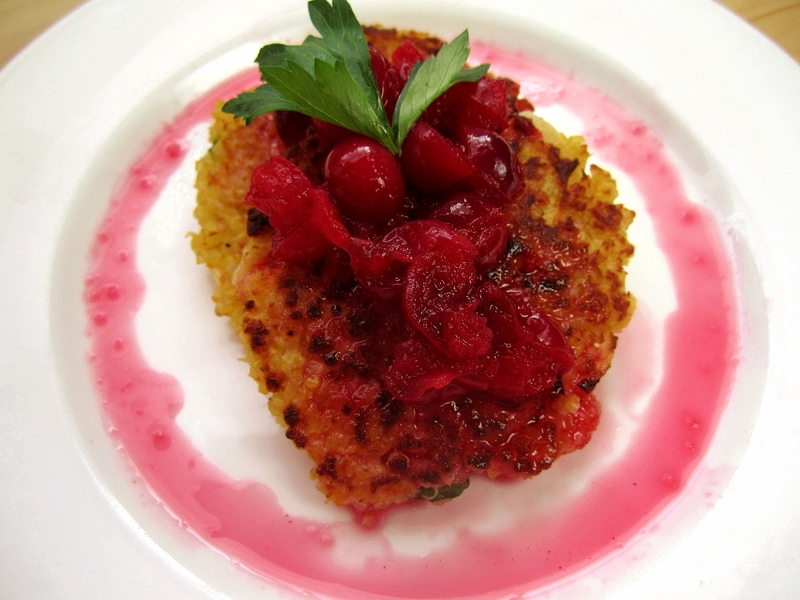 I love quinoa…one of my most favorite things…and the cranberry sauce is just perfect! It’s one of my most favoritest things too! Can you make these for me? like today? haha! =) I’m in looooove! For you, of course! Come on over! Oh, loving these quinoa cakes! The carrots are a great addition and I bet the parsley comes through too. Your cranberry-orange glaze is so pretty. Have you experimented with Stevia at all? It’s a plant based natural sweetener – just a nice alternative to be aware of. Yes, I finally started buying it last month! And I much prefer the taste of Stevia (and the fact that it’s natural), but alas, I was all out of it and had to use Splenda. Wahhhhh!!! These are gorgeous, and a perfect healthy Thanksgiving side dish. Yum! Stephanie… I wish I could cook and eat like you do all the time. My scale would not be so mad at me. : ) Both these dishes not only look delicious, but hey are so good for you too. Well done. I love quinoa cakes. 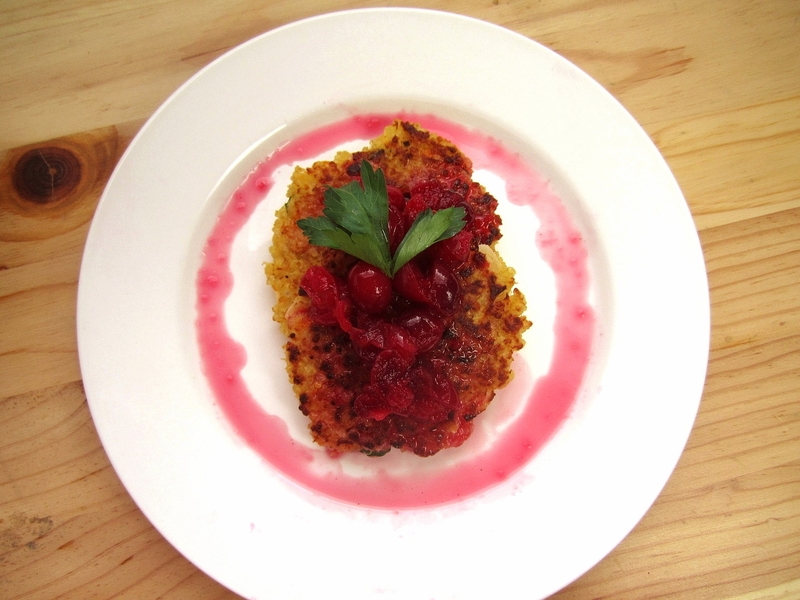 Perfect combination with that cranberry-orange sauce, yum! These look spectacular–and I’m always looking for new uses for quinoa. The lemon aioli sounds like a great idea although that cranberry-orange sauce also sounds amazing. Decisions, decisions! I have been trying to do the same thing the last few days. of course last night I ended up with take out that consisted of a burger and fries. Healthy huh? I love quinoa but have never made cakes. I like the cranberry touch to make it a seasonal meal. Great idea to use cranberry sauce on these rather than a tomato sauce like you might typically see. Great addition to Thanksgiving meals (especially for those of us who don’t like stuffing!). So interesting!! I have to give this a try! Quinoa is something we’re discovering now, and we appreciate finding creative ways to use it, thanks! Happy Thanksgiving! I have a stash of quinoa and your cakes look delish!!! And who doesn’t need some healthy recipes this time of year. Have a great holiday! That’s pretty nice quinoa cakes! creative and festive. These look amazing! They are going on my list of recipes to try! What a clever idea. I’ll have to make this in addition to all the other turkey trimmings as there would be war if there were no roast potatoes or stuffing. The cranberry orange sauce sounds wonderful too. I love the flavors going on in here! This looks so good. I am new to quinoa but I have to say I love it. I find it nutty and you know me and nuts. Love the way the color pops off this one. I’d totally eat half a dozen. I can’t get enough of quinoa and these sound like a must try. Thanks for sharing!